LEAVE NO TRACE is another strong female character drawn adventure drama after her successful WINTER’S BONE. Written and directed by her and based on the book My Abandonment by Peter Rock, the film premiered at the 2018 Sundance Film Festival. Bleecker Street will release the film in the United States on June 29, 2018. The summarized plot tells the story of a father and his thirteen-year-old daughter . 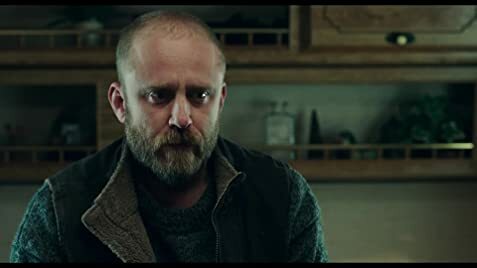 Will (Ben Foster) is an ex-military who has lost his faith in humanity for reasons not disclosed. 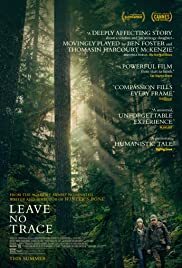 When the film opens, he and daughter Tom (Thomasin McKEnzie) live in an isolated existence in a vastly urban park in Portland, Oregon, (the film was shot in Eagle Fern Park in Clackamas County) when a small mistake derails their lives forever. They are taken in by social services. The film contains several embedded messages. The first and foremost is the question on homeschooling. Will and Tom live an isolated existence at the film’s start, living in conditions unacceptable by normal Americans. Tom sleeps in close proximity with her dad. Though this is a no-no, nothing sexual occurs. To is home schooled. When interrogated about this, The interrogator admits that Tom is advanced in her schooling though cautioned that she lacks the social aspect of education. But director Granik eventually pushes Tom towards normal life which she has not experienced. Tom loves the social and interactive aspect as they are slowly integrated into society. Until Will escapes with Tom back to square one. When an Will has an injury, Tom is forced to choose between the two lifestyles. LEAVE NO TRACE is Granik’s gentler more accessible film. There is much kindness depicted in this movie than in WINTER’S BONE. The truck driver and other strangers that encounter Will and Tom are always more than eager to help them. Both actors Ben Foster (THE PUNISHER, X-MEN) and Thomasin McKenzie deliver believable an human performances, worthy of any audience’s sympathy. As far as anticipation goes, one keeps wondering where everything is leading to and how everything will end. One can predict some friction between father and daughter when she makes her stand on independence. “The same thing that is wrong with you is not wrong with me,” is the all important line Tom confronts Bill with. And the reply; “I know.” The film moves on a different tangent when the father is an understanding and caring one. The film contains a few originally performed songs with original music by Dickon Hinchliffe. The cinematography of the vegetation and fauna of the national parks is effectively captured by Michael McDonough. LEAVE NO TRACE is that rare film that proves that confrontation in a story need not always be resolved by shouting, screaming and cheap theatrics. Here, the confrontation is resolved with reason and understanding. And the film succeeds as a quiet yet effective drama of human inadequacies that sort themselves out.